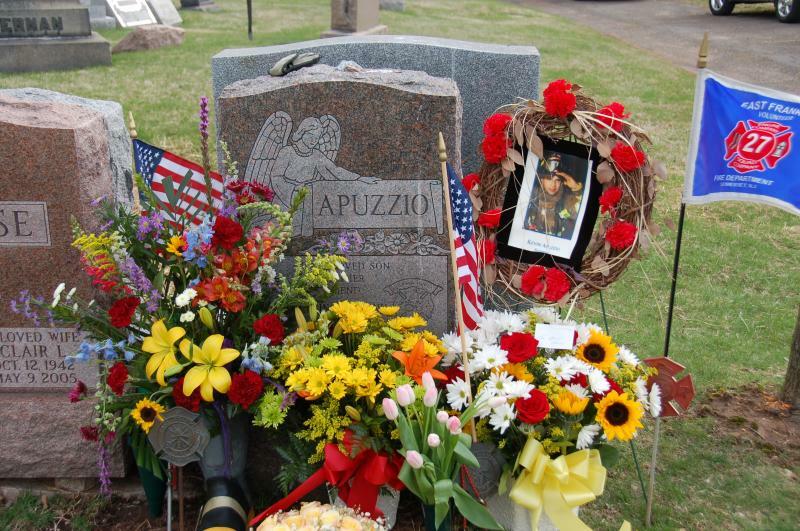 Friday, April 11, 2014 – Today marks the 8th anniversary of the tragic fire that took the lives of Firefighter Kevin Apuzzio and the woman that he was trying to save. Every year on this day family, friends and members of East Franklin gather for a mass at Kevin’s church, and head to the cemetery to honor our lost brother. “On April 11th, 2006, many of our lives changed in a heartbeat, especially the life of 21 year old Firefighter Kevin Apuzzio. Kevin stood courageous on the front lawn of 36 Whittier Avenue and said “Chief, what do you need my crew and I to do?” I Said “Kevin, go in …and get her.” While it only seems like yesterday, to me it is still clear as day. With a house full of heavy smoke and an elderly women confirmed trapped, Kevin (and crew) did not hesitate and attempted to rescue her. I knew when the floor collapsed and my Firefighters fell into that basement -literally just feet from removing her out the front door, from that point forward, their lives along with many others would be changed forever. While several were seriously injured and burned, Kevin lost his life with the victim he and his Brothers were valiantly trying to save. Kevin’s legacy lives on in many ways, not just through his friends and family, but now also through a book. Kevin’s father, Dr. Joseph Apuzzio, and Chief Krushinski are featured in a new book by Chief Billy Goldfeder, a 40-year fire service veteran, solicited insights and pearls of wisdom from our country’s greatest firefighters, fire officers and emergency responders. Copies of the book are available at: http://www.fire-police-ems.com/books/bp0190.shtml and all proceeds go to support great causes like the Fallen Firefighters Foundation and Chief Ray Downey Scholarship.